Oh, It's Good To Hear A Boisterous German Laugh! 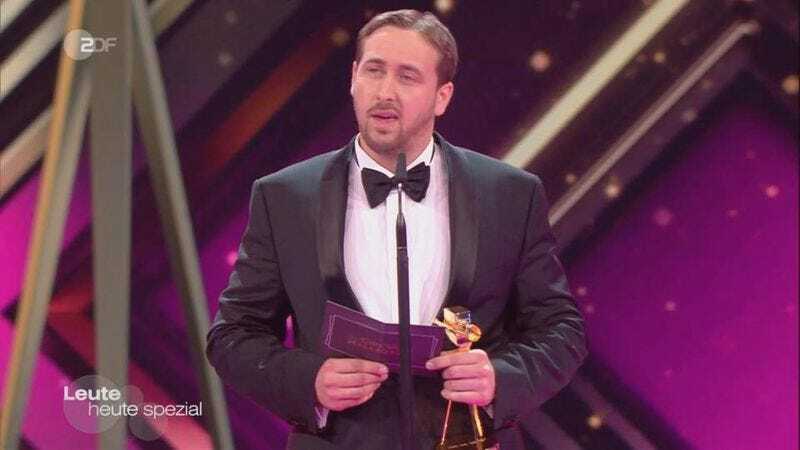 Offering a harrowing glimpse of an alternate reality where Hitler won WWII, a man who resembled a sloppy, third-generation clone of Ryan Gosling accepted a Goldene Kamera in Germany, where La La Land is still receiving awards and generating live television gaffes in an endless dystopian loop. The ceremony—famed for awarding American A-listers just for showing up, which explains the presence of Nicole Kidman, Colin Farrell, and Jane Fonda—had this integrity embarrassingly compromised by pranking comedy duo Joko Winterscheidt and Klaas Heufer-Umlauf, who reportedly hired a cook from Munich to pretend to be Gosling, solely to hear the delightful sound of awkwardly forced German laughter. Ultimately, it was a silly waste of time, but it was all worth it for the childlike delight that flickered across Jane Fonda and Colin Farrell’s faces. Following a prolonged, confused silence and some halfhearted clapping (or as it’s known in Germany, “bringing down the house”), Gaetjen returned to explain that there had obviously been a mistake, though this was just the sort of wild, spontaneous moment that can happen during these live broadcasts. Which is why awards ceremonies are always so much fun to watch and why we need as many of them as possible.